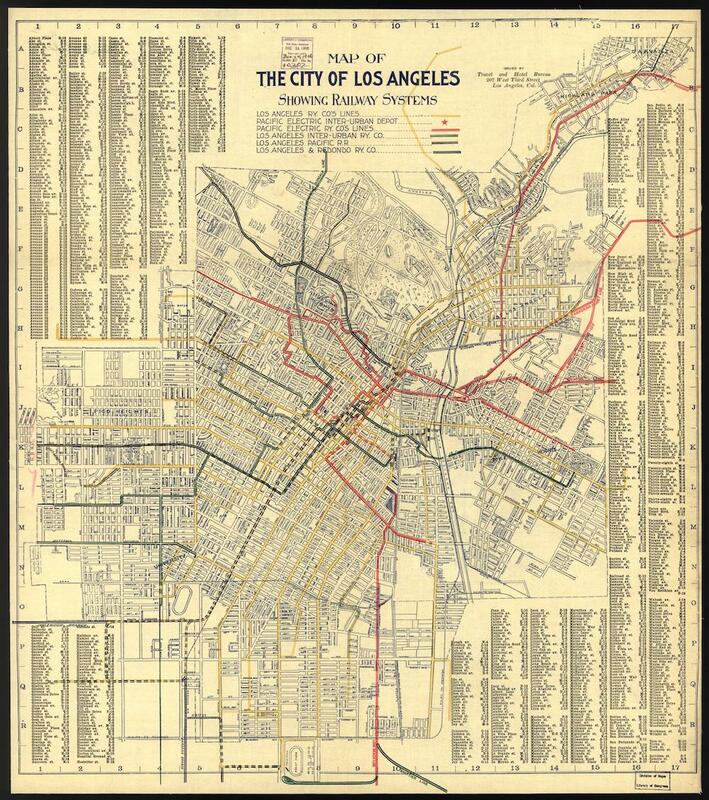 Transit history in Los Angeles: A 1906 map of the city's streetcar system. The Travel and Hotel Bureau of Los Angeles printed this map for visitors in 1906. At this time, a tourist would have been able to see much of downtown L.A. by rail. Multiple systems crisscrossed the city and offered access to suburban points of interest. While Los Angeles did briefly boast cable cars in the 1880s and 1890s, by the time this map was made, cheaper and simpler electric railways had rendered cable-car companies obsolete. The yellow lines on this map, which reach most parts of downtown, mark coverage by the Los Angeles Railway Company, which ran the local electric streetcar system from 1895 to 1945. It’s tempting to think of this era as a utopian one: Los Angeles in an age of public transport. But in the early 20th century, railroad magnate Henry E. Huntington owned both the Los Angeles Railway Company and the Los Angeles and Redondo Railway, while maintaining partial ownership of the Pacific Electric Railway Company—a powerful near-monopoly of local transit. In 1903, three years before this map was printed, Huntington’s Los Angeles Railway Company employees tried to organize and strike for better pay—efforts that Huntington managed to subvert by calling in police, playing workers against each other, and firing union employees. The Los Angeles Railway Company experience wasn’t always great for early-20th-century passengers either. Cars were often crowded, and riders found it hard to cram themselves onto (or hang onto the outsides of) the conveyances, sometimes suffering injuries when disembarking or embarking. The Metro Transportation Library and Archive has several great Flickr sets with historical images related to the Los Angeles Railway Company, including this one which shows types of passenger cars and this one which shows the streetcars in action. Click on the image below to reach a zoomable version, or visit the map’s page in the Library of Congress’ digital archives.